Architect the system. Architecting means determining which elements of the risk management framework, system, or process should be used and tailored based on the organizational context. Design the system. Designing the system means determining how each element of the risk management process can be tailored to specific organizational stakeholders, customers, and interested parties. Implement the system. Implementing means integrating the risk management framework and process into the organization’s general management system. This step is often a behavioral and cultural change in the project. Assure the system. Assuring means risks are being controlled within the organization’s risk appetite and objectives are being met. ISO 31000 risk management framework is descriptive not prescriptive. 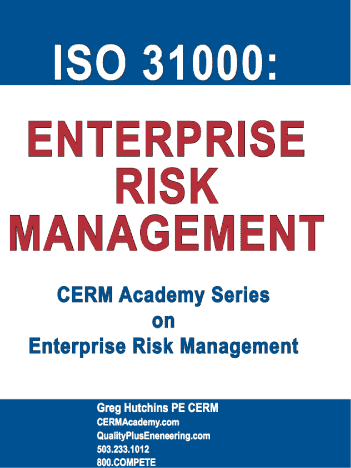 It describes in general terms risk management principles and elements of a framework. The purpose of the framework is to integrate risk management into ISO management systems such as ISO 9001:2015 or ISO 14001:2015. ISO 31000 is written so an organization may tailor its components to its context and specific requirements. Is an international standard that more than 60 countries have adopted as a national risk standard. Is practical for the small to medium sized organization getting into Risk Based Thinking. Can be applied and integrated into ISO management systems easier than any risk management framework. Can be applied to organizations in almost any sector, maturity level, and capability level. Is an open ended guideline that is flexible and open to interpretation so it can be applied universally. Encourage proactive, preventive, preemptive, and predictive™ decision making rather than reactive management. Identify and treat risks throughout the enterprise. Improve identification of upside risks (opportunities) and downside risks (threats). Improve corporate governance, risk, and compliance (GRC). Improve ‘Tone at the Top’ and other soft controls. Establish a reliable basis for risk based, problem solving and decision making. Allocate resources effectively and efficiently for risk management, treatment, and mitigation. Improve operational effectiveness, efficiency, and economics. Identify and minimize possible losses. Is structured around the PDCA cycle that most operations, six sigma, and quality professionals understand. Is a short standard that can be read easily and quickly.